Décor is to be appreciated by everyone who interacts with it. The interior designer/decorator is the one who knows the principles and elements and uses them as tools in creating the pleasantness of a room and presents to the occupants and viewers. Interestingly, most people have some natural instincts for good design, they are able to recognise good design when they see it, even though they are not aware of the principles and elements of design involved. Usually considered as the first of the element of design involves motion. Every line leads the eye. The eye naturally follows a line as it travels, whether through a landscape, around a room or over an object. Line as an element is not always straight we know it. A line in design practice may be straight, curved, horizontal, vertical or diagonal. What impact has line on décor? A horizontal line appears restful and stable because it is itself at rest in harmony with gravity. A vertical line seems to resist gravity and suggests strength and dignity. A diagonal line (neither vertical nor horizontal) seems to be restless and dynamic – neither up nor down, but rather “on the move”. A curved line brings into décor a sense of cheerfulness. In practice, an awareness of the impact of these lines, to which we are conditioned by nature, can be used to create, alter or modify moods in interiors decorating. The designer with good knowledge of the practicality of line does a great work by introducing the appropriate lines into a décor proposal of an existing décor. In essence it is widely believed that line can create or destroy the overall intended effect in a room. It can make a room dull or chaotic. When there are too many horizontal lines the room décor may look monotonous, too restful and somewhat dull. On the other hand too many vertical lines may make a room too imposing somewhat active. How do designers use line? 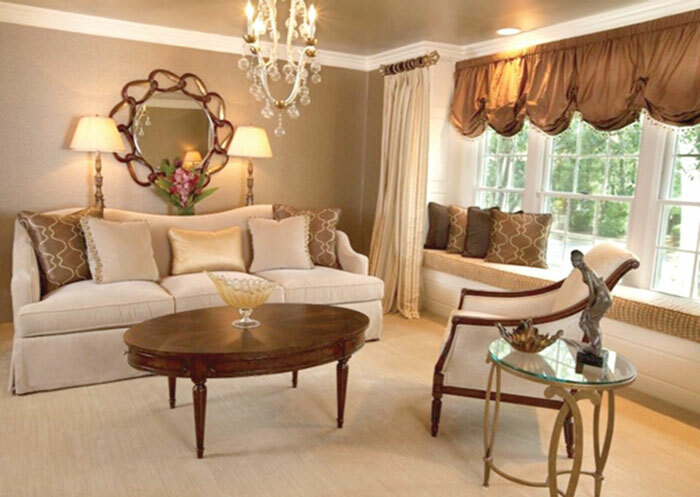 The designer’s job is to find a balance of lines that will create a unified but rewarding room. If most of the pieces in a room are low, adding a taller piece should break the monotony. In instances where there are too many tall pieces, that seem to create a strong and dynamic feeling, some “cooling down” will be required. To reduce the impact of vertical imposition in the room, you would break up the vertical feeling by adding some lower, horizontal pieces. The designer may introduce some diagonal elements or curved change the mood of décor in any given space. In the meantime look around to find out what kind of lines are prevalent in your décor.